Brake caliper piston dust seal "2"
Brake caliper piston seal "3"
a. Blow compressed air into the brake hose joint opening "a" to force out the piston from the brake caliper. Cover the brake caliper piston with a rag. 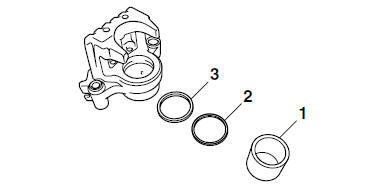 Be careful not to get injured when the piston is expelled from the brake caliper. Never try to pry out the brake caliper piston. b. Remove the brake caliper piston seal and dust seal.